One of my favorite parts about ABC's hit show Revenge is of course the fashion. Everyone is fit, attractive, and rich enough to wear an array of designer pieces. There is always an important party or fundraiser event, calling for sharp suits and elegant cocktail dresses. In the premiere episode of Revenge Season 3, Emily Thorne wore such a beautiful red and gold dress, I had to know who made it. It's the Carolina Herrera Baroque Jacquard dress (pictured bottom left). It's currently sold out, but way out of my price range anyway. Victoria Grayson, always in fashion as well, also sported a baroque print dress for Season 3 - episode 1. That dress is still available. It's the Alexander McQueen Cap-Sleeve Puckered Jacquard sheath dress (bottom right). 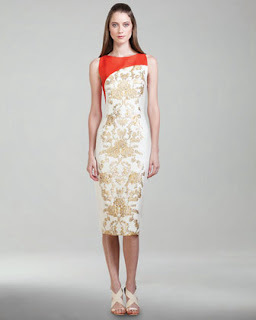 Jacquard and baroque dresses are on trend this season, especially for the holidays. Here are some more affordable baroque-print cocktail dresses for F/W 2013-14. I suspect I'd be lost trying to figure out that show. I've never seen it. Lifestyles of the Rich and Vindictive, I take it? Oh yeah, you'd have to go on a Netflix binge to catch up on the previous seasons. Yeah, it's basically a night-time soap only with better actors and and a much better plot. I like it because it's about a woman taking revenge on the people who killed her father. Love these dresses! You have some great choices here. I've been eyeing some with similar patterns by BCBG.